I was nervous. Mostly about 15 month old Amaya’s eating and sleeping, neither of which she is particularly awesome at. 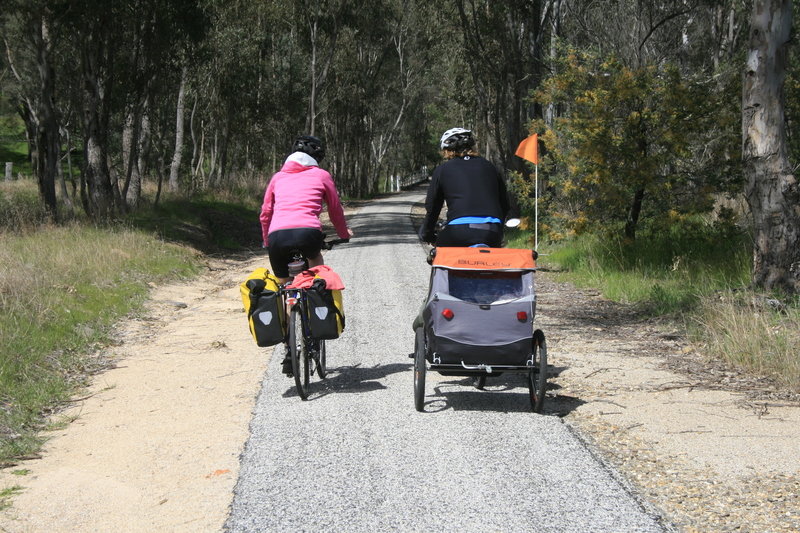 We rode 200km of the Murray to Mountains Rail Trail (Victoria, Australia), from Beechworth to Bright and back again (http://www.murraytomountains.com.au). Spring was a fabulous time of year to do it, with the countryside lush and green, the air crisp with mountain snow freshness, and just the right amount of sunshine. Mic’s parents, Garry and Helen joined us in the adventure. The days were deliberately kept short and manageable. As none of us were fit for touring, we wanted to enjoy the sites and winery’s, and we also weren’t sure of Amaya’s “Magic Buggy” tolerance levels. It turns out that her tolerance levels are not only quite high but her enthusiasm for touring almost matches our own. Four days in and the major thing Amaya was frustrated with was our tardiness in getting away in the mornings. She would often be impatiently sitting in the magic buggy waiting for us to get the final panniers on the bikes. It wasn’t all smooth sailing. We had trouble regulating Amaya’s heat while in the trailer. As soon as the sun began streaming through the tinted plastic windows the buggie would heat up like a sauna. We rectified this somewhat through opening the back and allowing greater airflow. But seeing none of us could actually fit in the trailer it was impossible to know what conditions were like for her. The temperature issue also contributed to a sleep issue. Amaya often found it difficult to get to sleep during the day and once asleep didn’t sleep for her usual (and essential) 1.5 hours. Riding the steady incline from Everton to Beachworth is hard enough without the constant whining of a one year old. Sleeping at night in our tent was also an issue. We were fine in our new Marmot down sleeping bags – but we quickly realised that the two infant sleeping bags and the numerous blankets and jackets were insufficient for Amaya when the temperature dropped below zero. We woke up in Bright to the drip, drip, drip of ice melting on the inside of our tent fly – I had spent most of the night sharing my sleeping bag with my little daughter trying to keep her warm. 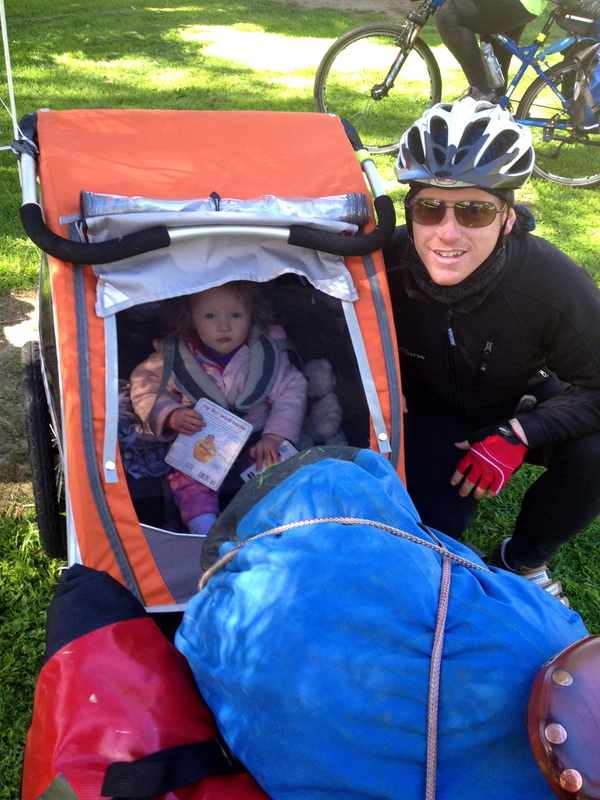 Better sleeping bag for Amaya – we have already ordered a new sleeping bag identical to ours (Marmot Hydrogen 850 down). We’ll tie off the bottom of the sleeping bag so that it is perfect for Amaya’s current length. Always leave early – latest 8am!!! on the two mornings we achieved this our day was so much better – it means there is time for the unexpected which is to be expected with a one year old. Thick socks, raincoat and boots for Amaya!!! We really just learnt not to skimp on gear for Amaya. We spend a lot of time thinking about our own gear and it shouldn’t be any different for her. Amaya is more adaptable than us!!! We spent too much time worrying about how she would adapt. The nervousness we felt at the beginning was unwarranted. She loved it – the world was her playground – she collected conkers, talked to birds, hugged trees, set up and packed up camp, sniffed flowers, barked at dogs and stomped on ants, read, ate, slept and read in her magic buggy. Ready to ride in the morning – Amaya spent the majority of her time reading. 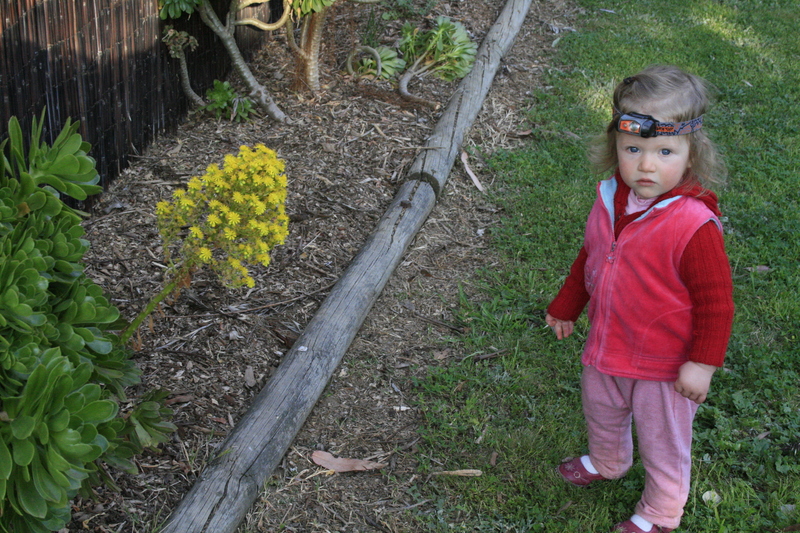 Amaya loved exploring the campgrounds with her trusty headlamp. 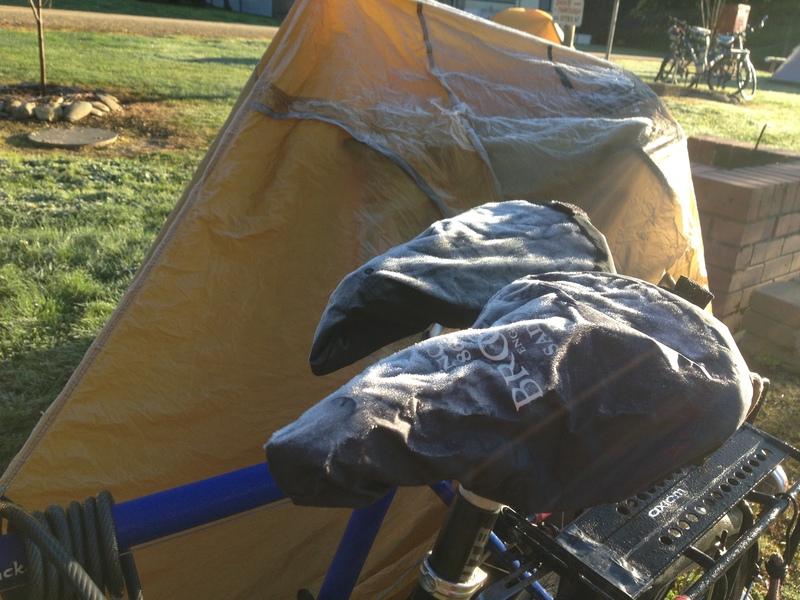 This entry was posted in Bicycle Touring in Australia and tagged Australia, Bicycle Touring, Cycle Touring, Rail Trail, Victoria by babyonabike. Bookmark the permalink.